For many years attempts have been made to establish that Richard III was not the out and out villain that Shakespeare presents to us, a difficult task since Richard III is one of his most compelling characters in a highly successful play. But he’s not the only character Shakespeare blackened who turns out to be much more complex and interesting when the facts are presented. 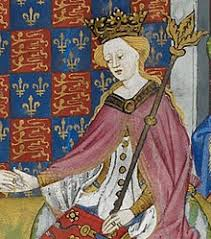 The Radio 4 programme In Our Time on 24 May 2018 was all about Margaret of Anjou, born in 1430 who became Henry VI’s Queen. 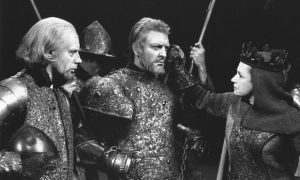 Shakespeare was following the Tudor version of history that insisted the civil unrest and divisions of the Wars of the Roses were ended only by the accession of Henry VII in 1485. In the final speech of Richard III the new king proclaims “England hath long been mad, and scarred herself”, predicting that its citizens will now enjoy “smooth-faced peace,/With smiling plenty and fair prosperous days”. The published accounts by Hall and Holinshed promoted these views. The Margaret of Anjou we see in Shakespeare’s Henry VI trilogy is a bad woman, vindictive, and violent. On our first sight of her, at the end of Henry VI Part 1 where the Duke of Suffolk captures her in France and at the age of 15 there is little sign of her character, picked up as a political pawn whose existence immediately causes dissention between Suffolk and the Dukes of Gloucester and Exeter. Margaret, however, would not be told what to do for long. Suffolk praised “Her valiant courage and undaunted spirit” and Edward Hall describes her personality: “This woman excelled all other, as well in beauty and favour, as in wit and policy, and was of stomach and courage, more like to a man, than a woman”. Politically the marriage was “both unfortunate and unprofitable” as “the lords of his realm fell in division among themselves”. When King Henry VI became unable to rule Margaret took over. Although talented, “often time, when she was vehement and fully bent in a matter she was suddenly like a weathercock, mutable and turning”. Hall judges that the villains of the piece were the “venomous serpents, and malicious tigers”, the warring nobles, rather than Margaret who they exploited. A contributor to the Radio 4 programme pointed out how badly Shakespeare gets this wrong as Margaret wasn’t even present at the Battle of Wakefield. As with Richard III, it isn’t fair to put all the blame on Shakespeare, taking his information from Edward Hall’s The Union of the Two Noble and Illustre Families of Lancastre and Yorke. It’s Hall who places Margaret on the battlefield, making her responsible for the merciless beheading of prisoners and setting their heads on poles at the gates of York. The detail about the paper crown is also in Hall, though it’s Clifford who does this after York and his son have been killed. Hall gave Shakespeare the cue from which he created one of the most memorable scenes in all his plays. But I will rule both her, the King, and realm. Shakespeare’s audience would have picked up the reference and understood its meaning, though Suffolk underestimated Margaret. In Our Time, containing much more about the life of this extraordinary women, is still available to the listened to again. This entry was posted in Plays and Poems, Sources and tagged Edward Hall, Henry VI, In Our Time, Margaret of Anjou, Richard III, sources, Trojan War. Bookmark the permalink.